Tips on buying chandeliers and explanations as to the different types of chandeliers available. Tips to Lighten Your Path! Chandeliers are considered to be one of the most elegant of accessories a person can add to his or her home. There are literally thousands of chandeliers available on the market today, and in vast arrays of different sizes, styles, and choices of crystal or glass, wrought iron or rustic. You can just imagine the eminently distinctive and romantic beauty of a hand-blown Italian glass chandelier bobbing along the canals of Venice in a gondola slowly making its way to your living room. Alternatively you may feel much more comfortable with the clean lines and style of an ultra-modern piece, or anything in between. With options and choices for lighting, you're almost certain to find a style that suits your taste, your space, and your budget. You should be aware that if you've ordered a high quality design in hand blown glass, you may at first be disappointed in some of the rough finishes. However to an expert these seeming ‘blemishes’ are regarded as its certificate of uniqueness; they are the hallowed seal of a master craftsman. So, before you buy, make sure you do some homework on how to evaluate their quality, such as when rough edges mean rough products and when they don't. 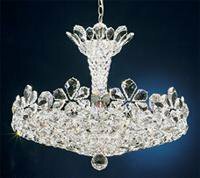 When it comes to a crystal chandelier, it is the quality rather than the size of those gleaming jewels that matters. 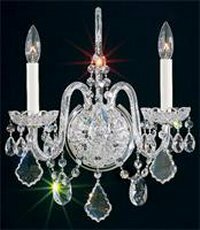 Chandelier manufacturers use everything from top-of-the-line Swarovski crystals and high-quality Murano glass to the slightly lower qualities of glass perhaps of the Bohemian-style glass lighting . At the other end of the scale you will find many cheaper quality products that simply use a transparent polymer, but also to great effect. Top chandelier designers like Schonbek and James Moder use only the best Swarovski crystals for their high-end models, and these materials quickly inflate prices into the thousands of pounds and beyond. 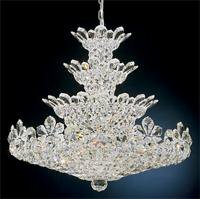 However, for those of us looking for something a little more modest in price, those designers, along with many others, offer smaller chandeliers with a range of crystal quality to accommodate our budget. How much you want to spend on a chandelier will most likely relate to where you plan to put the chandelier in your home, and vice versa. For example, if you want to feature one in one of your main reception rooms, you might want to consider investing more into it than, say, a chandelier hanging in your foyer. Why? Guests don't like to linger in the entrance hall for very long. A cheaper chandelier there will suffice, welcome and impress. They will however be spending more time in the dining room casually savouring the glassware while imbibing their meal and wine. If you are going to invest more in a piece, you can also actually consider it as a long-term investment, and an heirloom. We would then recommend that you lean more towards a well-designed, higher-quality model perhaps also with a famous brand name. After all it will be gazed upon and admired for long periods of time and most likely every day if placed in the living room, rather than one that will be noticed but not closely studied whilst passing through the hall. They become a conversation piece and remember that there are few things more pleasing to you as the host than being aware of your guests admiring, and listening to them commenting on, the exquisiteness of your choice in centrepieces and features that you have gone to some efforts to acquire. Chandeliers are just as much about making a statement and creating a mood in a space as they are about lighting. Although your purchase will definitely bring new illumination to the room, it may not be enough for all of your lighting needs. 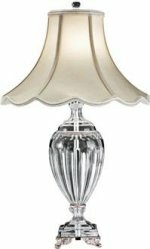 Most likely, you will also want to add table lamps, floor lamps, and/or wall sconces that match or coordinate with your chandelier design. You may want to add some extra light by your favourite reading chair or just have background lighting for a more cosy ambience or perhaps while watching television or a film. The Murano Venetian chandelier has been a prized symbol of elegance and enchantment for many years as has the cascading crystal designs. Their beauty and elegance make an absolutely wonderful addition to anyone’s home. And with the amount of choices we have today, you can so readily find a chandelier that fits your style and won’t put a huge dent in your bank account. A chandelier is a beautiful piece of art that you, your children and your visitors will enjoy for years to come. You will be proud of your sparkling investment, which is sure to become one of your more desired and treasured family heirlooms. Author: Julian Pollock is an enthusiast of antiques and precious artifacts. He is the principal contributor to a resource that illuminates everything from contemporary and modern chandeliers to the more traditional rustic lanterns and sconces.